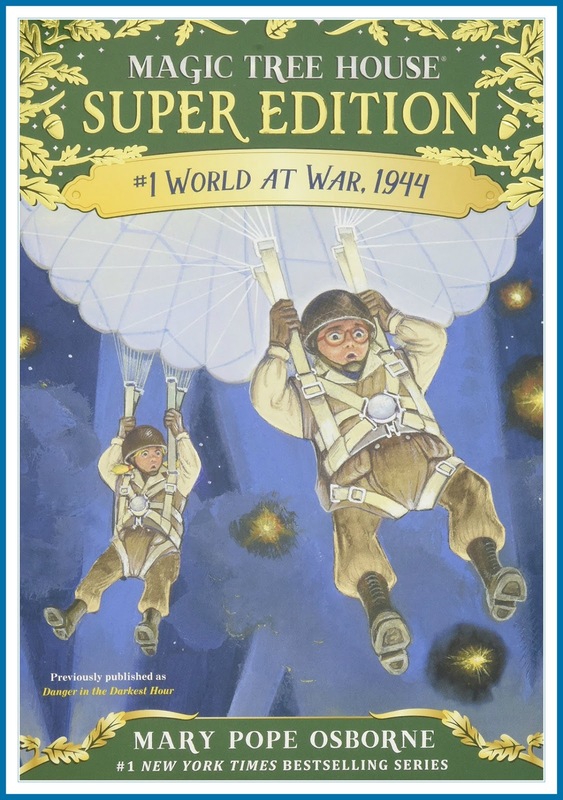 In World at War, 1944, a Magic Tree House Super Edition, Jack and Annie are transported to World War II by the Magic Tree House. Europe is in trouble and they must go behind enemy lines to crack a code that could save a lot of lives. And.... this has to be accomplished before D-Day - which is the day after they are transported back in time to England, then parachute into Normandy, France. Sometime after midnight, 100,000 allied soldiers invade by sea & air to drive the Nazis out of France. It was to be the beginning of the end of World War II. This particular book is one of the Super Edition books, which goes beyond the story about Jack & Annie's adventures in time just prior to D-Day. With a longer story and additional facts and photographs, the Super Edition books also give facts about that point in time. In World at War, 1944, young readers in the age group 7 to 10 years learn about spies and the resistance movement in France, the National Pigeon Service where trained carrier pigeons carried secret messages, and what life was like for the people of France during the second World War when their country was occupied by German forces. The Magic Tree House adventures for Jack and his sister Annie began one day in Frog Creek, Pennsylvania when a mysterious tree house filled with books appeared in the woods behind their house. Jack & Annie soon discover it was magic and that they could go to any time and place in history just by pointing to a picture in one of the books. As you read the Magic Tree House series, you will see how this magic came to be. In each Magic Tree House book Jack & Annie are able to travel to various points in time. They touch a picture of the place they want to go, say the magic words "I wish we could go there" and.... the wind begins to blow, the tree house spins, then everything is absolutely still.... and they are there! This is also how they return home! Why I Purchased "World at War, 1944". In March, my young grandson, David, visited 'grandma's house with his family. While the family was here in Coastal Georgia, we toured Fort Pulaski, a Civil War monument located east of Savannah, GA. David was quite fascinated with the cannons and the rooms set up in historical representation of that time in history. At the end of our tour, we stopped in the 'gift shop' and David found the Magic Tree House adventure about the Civil War. He was absolutely delighted with that book, so much so that he carried it everywhere their entire vacation and had read it 3 times before they left for home at the end of the week. You can read my review of that book, Civil War On Sunday, here on Review This! 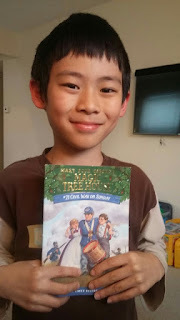 David had his 8th birthday coming up the following month, so I'd asked him what he'd like to have and he pointed out the next Magic Tree House book he wanted, in a list at the back of the Civil War book. He picked the next war history he wanted to learn about -- World War II and D-Day. This image shows David with his birthday book ~ World at War, 1944! And this is my review of the book, which I read before I mailed it to David in his birthday package from grandma. Happy Birthday.... and Happy Reading, David! Some of the children I've worked with enjoy the Magic Tree House series. I had forgotten about the series. Wonderful review and thank you for the reminder. Thanks, Dawn Rae. 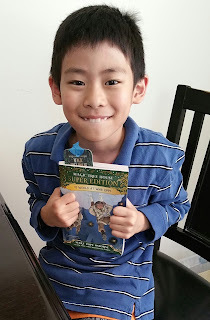 I actually learned about the Magic Tree House series myself from my little grandson. Now it is easy to select gifts for him as he wants the 'whole' series. :) I'm delighted that, at only 8 years old, David loves to read and to learn. Such a wonderful way for learn history! I truly think it is awesome that your grandson wants books, and especially books on history. He must truly be a very intelligent young man. Happy Birthday David! I hope you enjoy every moment of your special day! I also meant to comment about how your review makes me wish I had a youngster I could gift with this collection of books. They really do sound fabulous! My grown-up boys are still very interested in history and their interest began with books such as the Magic Tree House series. Obviously your David has held onto his interest in the topic and still loves these fabulous books. Isn't it great to have a "go to" gift idea for David, for birthdays and other occasions? Appreciate the timely review with the D-Day anniversary earlier this week. Thanks, Susan. The occasion of D-Day was one of the reasons I wanted to write this particular review this week. Happy your grown-up sons enjoy history. I always did; in fact, it was my minor in college. This is just the sort of story that will entice boys to read. It's wonderful that your grandson is so engaged with this series. I hope it leads to a life-long love of history. This would be a great book to give my two grand nephews especially because my father was in WW2 so this would connect them to him as well. I felt the same way, Mary, because my dad served in the Navy during WWII and this book gives David a connection to his great-grandfather. Thanks for visiting, Louanne. I am delighted to introduce you to this series of books for children. It's turning out to be a terrific discovery, introducing David to this series of history stories for children. Thanks for stopping by, Barbara.